Today we’d like to introduce you to Capt. Greg Ball. Capt. Greg, can you briefly walk us through your story – how you started and how you got to where you are today. I started fishing the Gulf of Mexico at a very young age at about 4 years old with my father Don Ball. He would take me on offshore fishing trips with him all the time. I loved fishing so much and growing up on the Gulf coast, at a young age I wanted my own boat. My dad told me when I was 12 years old that If I could make the money to buy my own boat that I could have one. So I started working for the newspaper as a paper boy and mowed grass and anything else I could do to make a little money and within a year at age 13 I had my own boat. Me and my buddies would fish lots of afternoons after school and weekends and I still fished at least once or twice a week with my dad all though high school. I graduated high school and worked selling cars for my dad at his new car dealership, then opened a used car lot myself and a new boat dealership. I had also been buying rental property all along and in 1995 I got out of sales and went into nothing but buying, remodeling and renting real estate and flipping houses. That was a great job until hurricane’s Rita in 2005 and Ike in 2008 came along and wiped out almost everything I had. I prayed about what to do and was led to sell everything I had and buy a big Hatteras sports fishing yacht and start fishing. 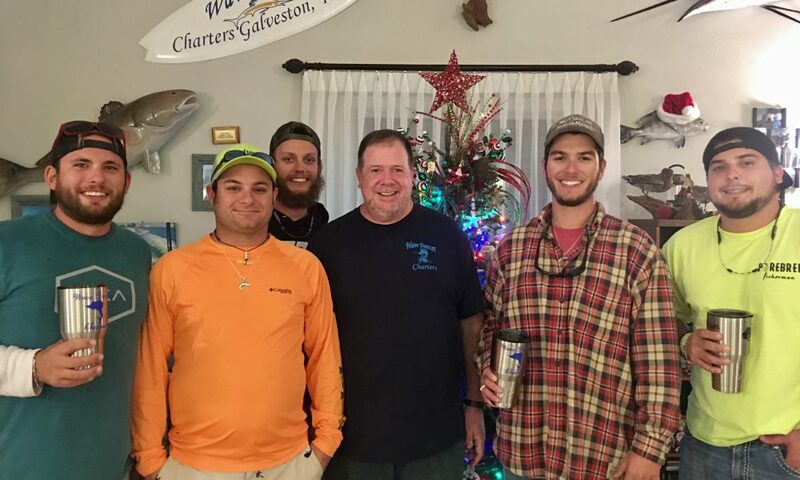 One thing led to another and my Stepson Taylor Borel and I were talking one day and decided that we should go to captain’s school and get our license and start doing offshore fishing charters for a living and that would give us extra money to go fishing for ourselves too. He was 19 or 20 at the time and had gone fishing with me since he was a small child and we had plenty of sea time to get our 100 ton Master Captains License, so we did just that. We started our company in 2011 with that one boat and now we have 3 in our fleet and two are federally permitted to run up to 80 or so miles offshore with up to 6 fisherman on board. I have always been told that you will never work a day in your life if you love what you do. This is that kind of job, we work 7 long days a week 365 days a year (well we do take off for Christmas and Easter) but it is the most awesome job in the world, watching people fight and land lots of huge fish and see how happy they become and proud of themselves. We help people make their dreams come true and check fish caught off their bucket list. We get to do lots of charity events for the less fortunate, handicapped, disabled children and adults, and we get to meet the best people in the world while fishing. It’s been fairly smooth with a few bumps along the way with expense of maintenance and upkeep on the boats. Because we run almost every day of the year and almost 500 charters a year on 3 boats you can imagine that we have lots of upkeep. In 2015 we bought all new motors for our boats and it’s been a lot easier and less expensive ever since we did that. The other problem is with anything you do, there are laws, state and federal and the same goes with Charter for Hire fishing. We have been battling the state and the federal government for years on fish stocks and leaving our seasons open longer or giving us some more days and let us fish them when the weather is good. It’s been a hard battle but we are starting to win and things are getting lots better. We joined the Charter Fisherman Association and they are on the right track to getting everything worked out for us to have more fishing days. The only other real struggle that we have is Mother Nature. We get trips booked and then can’t run them for bad weather and then we lose a day of work because of it. Other than those few things it’s smooth sailing most of the time. Please tell us about Wave Dancer Charters. Our business in fishing and fishing is good!! We specialize in taking people out to have a lifelong and memorable experience on the water by catching lots of fish and/or big fish. We take families with kids, Men and Woman, experienced and novice fisherman, we teach while we catch fish if they have never fished before. We also do multi boat trips for large groups, bachelor parties and cooperate events. We do near shore/close offshore charters for a half day or full day year round and we do Shark fishing trips and then we specialize in Deep Sea and Blue Water trips for lots of species of big fish. We were the top 2 boats out of 3 places on the whole Texas coast for Red Snapper landings last year. Our 2 federally permitted boats landed more Red Snapper than any boats on the whole Texas coast. We have been voted best of Galveston 2013, 2014, and 2015 and Capt. Taylor Borel and myself Capt. Greg Ball have been voted best Capt. almost every year since we started this company. We are set apart from others because this is a full-time job for us, we live it every day, even when we don’t have customers on the boat we are fishing and finding or making new spots to fish. We have the best kept boats in the Galveston fleet with all new and updated equipment, new engines, life rafts, satellite phones on all boats, satellite tracking device with email and text from anywhere in the gulf and all new fishing tackle every year. We also have the most knowledgeable deckhands on our boats to help our customers on every trip as well so that they will have the most enjoyable experience ever while aboard our boats. Started with a new boat, haha! I wouldn’t change a thing our business started off good and has just continued to get better ever since.